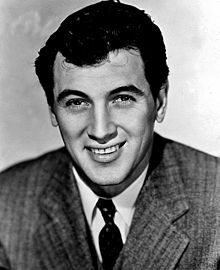 Rock Hudson (November 17, 1925 – October 2, 1985) was an American movie and television actor. He is famous for his good looks and remembered as a romantic star during the 1950s and 1960s, especially several movies where he starred with actress Doris Day. Hudson was voted Star of the Year and Favorite Leading Man, by many movie magazines and was one of the most popular movie stars of the time. He made nearly 70 movies and acted in several television productions during a career of more than three decades, and he received the Golden Globe Award four times. Hudson was a closeted homosexual. He was one of the first major Hollywood personalities to die from AIDS. This page was last changed on 12 June 2015, at 00:54.